Concerted vs stepwise (Meisenheimer) mechanisms for aromatic nucleophilic substitution. My two previous explorations of aromatic substitutions have involved an electrophile (NO+ or Li+). Time now to look at a nucleophile, representing nucleophilic aromatic substitution. The mechanism of this is thought to pass through an intermediate analogous to the Wheland for an electrophile, this time known as the Meisenheimer complex. I ask the same question as before; are there any circumstances under which the mechanism could instead be concerted, by-passing this intermediate? To start, I will adopt Nu = Cl(-), X=Y=H, and as the positive counter-ion I will use the guanidinium cation. As usual, wB97XD/6-311G(d,p) with a continuum water model applied. A transition state is located at the half way stage, indicating no intermediate Meisenheimer! It represents in effect a direct Sn2 substitution at an aromatic sp2 carbon. The barrier for this (unactivated) substitution is very high (an imaginary νi 507 cm-1 for the asymmetric Cl-C-Cl stretch confirms it as a transition state). With Nu=F(-), the barrier decreases significantly and the curvature of the potential at the transition state becomes much broader (νi 130 cm-1), a prelude perhaps to the mechanism transitioning from being concerted to a stepwise manifestation involving a discrete intermediate. Finally with X=Y=NO2, Nu = Cl(-), a proper Meisenheimer intermediate is now located; the asymmetric Cl-C-Cl stretch is no longer imaginary but real (ν 385 cm-1). 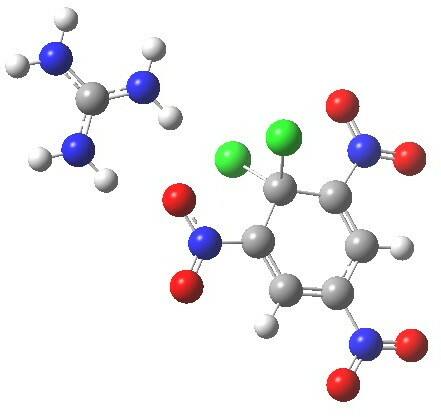 This is closely related to a known crystal structure (Nu=OEt with Cs replacing the guanidinium cation). Click to view asymmetric Cl-C-Cl stretch. So we see here a mechanism which can be finely tuned by the substituents to exhibit either concerted mechanistic behaviour, or armed with groups that stabilise an intermediate ion-pair, to transition to a fully stepwise reaction. There is one other aspect I want to explore. In the Meisenheimer intermediate, the cyclic conjugation and hence the aromaticity of the original aryl ring is (at least partially) interrupted. But what of the concerted transition state; must it too loose the original aromaticity? In the structure diagram drawn at the top of this post, I hinted it might not! A NICS(0) probe place at the QTAIM-determined centroid of the aryl ring (X=Y=H, Nu=Cl) indicates a value of -9.0 (benzene itself is about -10 ppm), indicating relatively little cyclic conjugation is actually lost in the transition state. The nature of the molecular orbital confirms this. 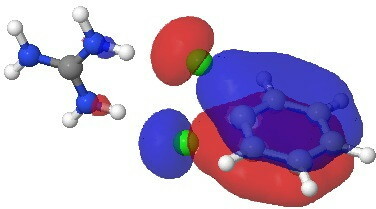 Shown below is the most stable of the three aromatic π-MOs, again resembling that of benzene very closely and the two C-Cl partially formed bonds participate fully in this conjugation. So we might call this strongly hyper-conjugated aromaticity. So I end by restating that this classical text-book mechanism, in which aromatic nucleophilic substitution is shown as proceeding through a Meisenheimer intermediate (the analogue of the electrophilic Wheland intermediate) may in fact only be true of aryl groups substituted with electron withdrawing groups. Without these, the mechanism converts to a concerted type, albeit with a much higher reaction barrier, possibly high enough that no actual examples of this type actually occur in reality. But it again reinforces that mechanisms may not always be what the text-books tell us. This entry was posted on Monday, March 25th, 2013 at 7:55 am and is filed under Interesting chemistry. You can follow any responses to this entry through the RSS 2.0 feed. You can leave a response, or trackback from your own site. Our research group is finding similar results with nitrothiophenes when the leaving group is bromide, compared to phenoxy groups. IRC calculations seem like a great idea to verify this. Keep up the great work. My former PhD student, Andrew Cairns, has just pointed out your blog. As it happens, we have published a concerted displacement where the Meisenheimer complex is not an intermediate (http://onlinelibrary.wiley.com/doi/10.1002/chem.201304241/abstract) – you might like it. Concerted vs stepwise (Meisenheimer) mechanisms for aromatic nucleophilic substitution. is licensed by Henry Rzepa under a Creative Commons Attribution-Noncommercial-Share Alike 3.0 United States License.